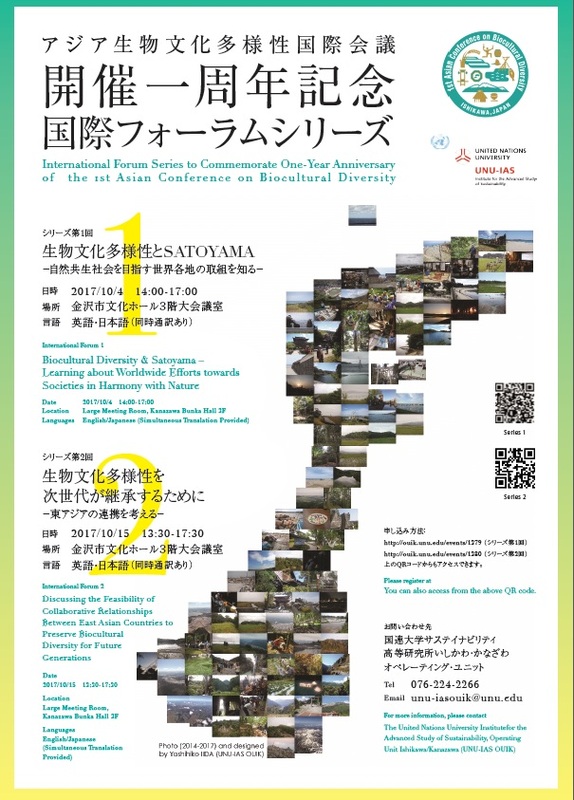 The second forum will be held celebrating the East Asian Members’ Assembly of the International Union for Conservation of Nature (IUCN) in Kanazawa. In this forum, we will discuss the East Asian biocultural diversity issues and explore with youth how we can pass on the biocultural diversity to the future generations contemplating each case study presented by the representative from Japan, China, and the Republic of Korea. Kanazawa City was selected as “Culture Cities of East Asia” for next year, 2018. It is highly expected that this selection will accelerate solidarity among three countries, Japan, China, and Korea, through culture. This forum will bring the opportunity to discuss the feasibility of collaborative relationship between East Asian countries in the context of preservation of biodiversity and cultural creativity. Cases from China, Korea, Japan and Report of the Youth session at The Tripartite Environmental Ministers Meeting Among Japan, China and Korea (TEMM) to discuss how to enhance the youth partnership among the three countries.